I got braces! Not really a big surprise since I made a huge deal about it LOL but thank you thank you all who gave me advice and answered my questions! You guys were a huge help! 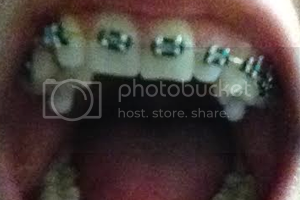 <3 First I'll just post some pictures of my braces and then I'll talk about that a little. Tooth pictures ahead in case some of you get grossed out. So basically I only got the top part (which I'm very thankful that my ortho didn't give me a mouth full of metal on my first go). I'm eventually going to get the bottom set too obvs because I'm going to have to wear rubber bands and all that fun stuff. So I got them on Wednesday, April 9. Yes, I got black. And I don't think I could've picked a better color. I am loooving the black! I think I might try other colors, but honestly, I think I'm sticking with black. haha Also, they didn't really hurt for me which is really weird. I guess by the second/third day it was really uncomfortable and tight, but not like paaaainful (I guess that's partly because I didn't put both top and bottom on at once). The thing I would say actually hurts is when I accidentally knick my front right tooth with my toothbrush or a straw or something omgggggg idk why that tooth is super sensitive. guys these attachments are, pardon my French, absolute hell. If you guys look at the second picture look at my back teeth. See those two huge, white things sticking out? Well those are the attachments to prevent my overbite from closing over my tooth that's pushed back. The worst part about first putting them on was definitely the attachments. I had a lot of trouble eating and it wasn't because of the pain, it was because of these dumb things sticking out of my back teeth. I was sooo scared they would pop off (and I'm still scared but not nearly as precautionary anymore lol oops). They're super uncomfortable, but I've already gotten used to them. I feel like it'd be weird without them now lolol. I think I've managed to psych myself out by looking at pictures and watching YouTube videos about plaque buildup and gross white squares on your teeth after you remove your braces. So I pretty much brush my teeth really carefully after every meal (which I've brushed my teeth four times a day at max, but I've minimized it to three times haha). My bedtime dental routine literally takes 15 minutes. First, I brush my teeth (which takes about five minutes). Then, I go through and use the proxy brush (which is this little thing in case you guys were wondering). After that, I floss carefully which is the worst part lolol. Then, I use mouthwash and finally I'm done. 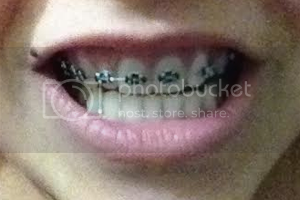 I know you guys might think I'm a little OCD, but I really want to keep my teeth clean and as white as possible because I think yellow teeth are gross especially on people with braces. And dental decay is ugh so gross to even think about. I know I wanted to tell you guys more, but I can't remember what else I wanted to say. D: So I'll just move on and hopefully remember eventually. I got one of my premolars extracted (upper right four). That was probably worse than anything I'll experience with braces hahah. The procedure itself didn't hurt (only when he stuck the needle in my gum to numb it). It was just uncomfortable because I knew it was coming and he was tugging my tooth and rocking it back and forth until it came out lolol. This procedure felt like it took FOREVER but it was actually pretty quick. I BLED SO MUCH. He actually said "you beld more than usual." oh gee thanks for making me think something is wrong with me, dentist. I tried to spit the blood into the little sink, but my mouth was numb so it ended up going everywhere and drying around my mouth it was just terrible. Then he stitched it up, put a little gauze on it, gave me special instructions and I went home. Oh and btw, the tooth he extracted was HUGE. For the rest of the day (and I got it extracted at noon) I sat on the couch and watched Netflix and had to keep spitting blood. I had to keep wiping the corners of my mouth because I was drooling and bleeding and I had to keep getting up to clean the blood from my teeth and mouth. I was literally miserable. I couldn't eat anything. I basically ate ice cream because he said that might help reduce bleeding and it was also easiest to eat. Not to mention the fact that I started looking into dry socket and I PSYCHED MYSELF OUT. I really need to stop doing research on things and just leave them be. So I did that on Good Friday and it's already healing pretty nicely. I got the stitches removed last Wednesday and things have been well since then. It'll take a while for the hole to close up, but I'm just glad it's healing. It feels really weird not having a tooth there obvsly. Okay, well, I think that's where I'm going to stop for today because I really should be getting to bed hahaha. Remember how happy I was when I first got my braces on too! Mine never hurt either, which I didn't expect because everyone rants and raves about how painful it is!